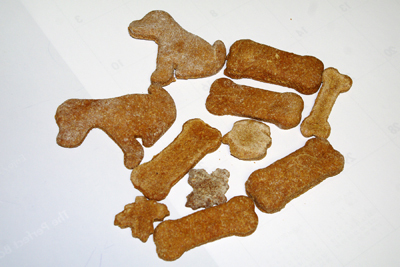 One of the service/fun projects at last week's M&M Day involved making dog biscuits. The plan is to bag up the biscuits and have them available during the Soup Sampler - asking people to make a donation towards the 2011 Destination: Mission trips. I wish I had pics of the kids rolling them out. I guess I forgot to pick up the camera - we got busy making them, and well, I only have a picture of the finished product. The biscuits turned out GREAT! The kids loved making them (the dough was a bit "tough" because it was like bread dough), and according to the moms who "test drove" the finished product, it is definitely puppy approved! So, here's the recipe we used, if you want to try and make it yourself! 3/4 C. Water, room temp. 1) In a large mixing bowl, cream margarine (or butter) with flour with a pastry cutter. Set aside. 2) In a small bowl, dissolve powdered skim milk and garlic powder in water and wisk in beaten egg. 3) Make a well in the flour mixture and gradually stir in egg mixture until well blended. 4) Knead dough on a floured surface, about 3 to 4 minutes, until dough sticks together and is easy to work with. Then with a rolling pin, roll dough to between 1/4 and 1/2 inch thickness. 5) Cut with a cookie cutter and place on a lightly greased baking sheet. Bake 50 minutes at 325 degrees. 6) Cool on a rack until hard and store, at room temperature, in a container with a loose-fitting lid. Want to try a couple of other recipes? made by my friend Mariesa! Mix together and roll teaspoon full of dough into balls and place on the greased cookie sheet. Flatten slightly. Bake for 20-25 minutes @ 350 degrees until browned. Mariesa said a batch makes approx. 80 small (pecan ball) sized biscuits. Mix ingredients together, and spread in a 13 x 9-inch pan lined with foil. Bake at 350 degrees for 25 mintues. Mariesa said that she likes to cut them into 1-1/2-inch squares, kind of like brownies.